Along the way, I’ll share other tips that will help you get the most out of your mask session and keep your skin clear and happy! 😉 Like this BEAUTY TIP — Use baking soda mixed with your facial cleanser to gently exfoliate your face every evening. This helps remove dead skin cells and promotes healthy cell turn over. The ingredient list is super simple. 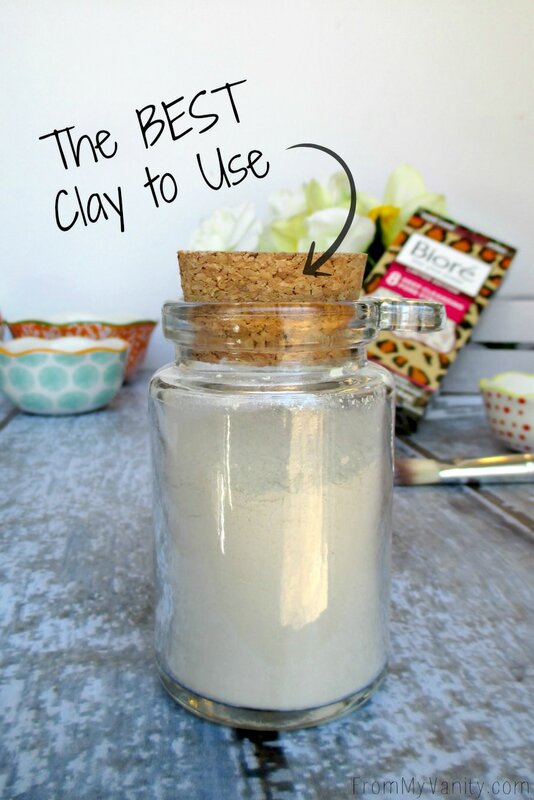 The best clay I’ve ever found to use is Bentonite Clay. It will last you forever — I purchased a two pound tub and am still using it after 2 years! So affordable! The only other ingredient you need is water. 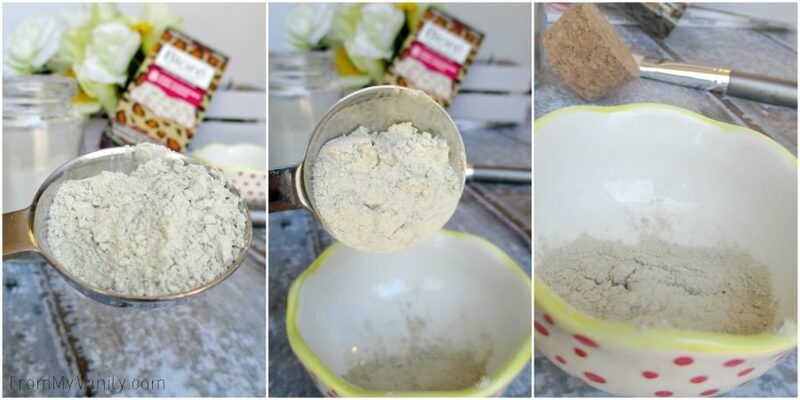 I take about one overflowing tablespoon of bentonite clay for my face, and add enough water to achieve the consistency I like. If you like thinner masks, add more water. I don’t mind my mask being a bit thick. It makes it easier to apply! 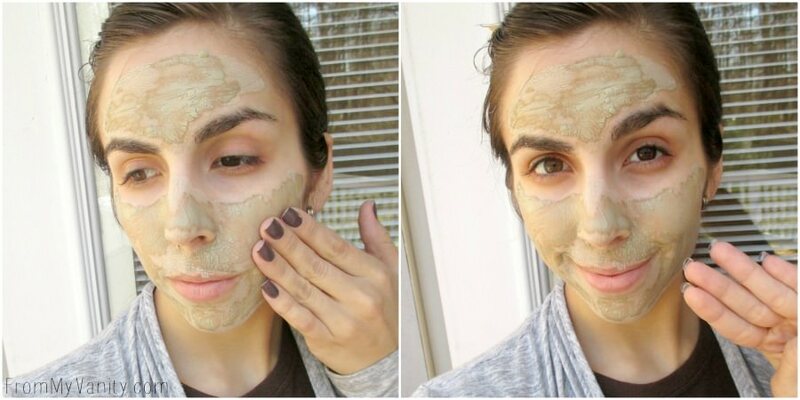 Your mud mask should look something like this! If you don’t have a flat foundation brush, you can totally use your hands. I prefer the brush as it keeps my fingers clean and makes applying an even layer easier for me. BEAUTY TIP — Before you apply your mask, steam your face. This helps to open your pores so that the mask can better clean out all the gunk from your pores. You can use a device or just wet a rag under hot water and let it sit on your face for a few moments before applying the mask. Once you apply a thin layer all over your face, let it set for 10-15 minutes, depending on the consistency of your mask. Basically wait until it’s so dry that it doesn’t transfer onto your fingers when you touch it. 🙂 Once it’s dry wash it off and you’re done! 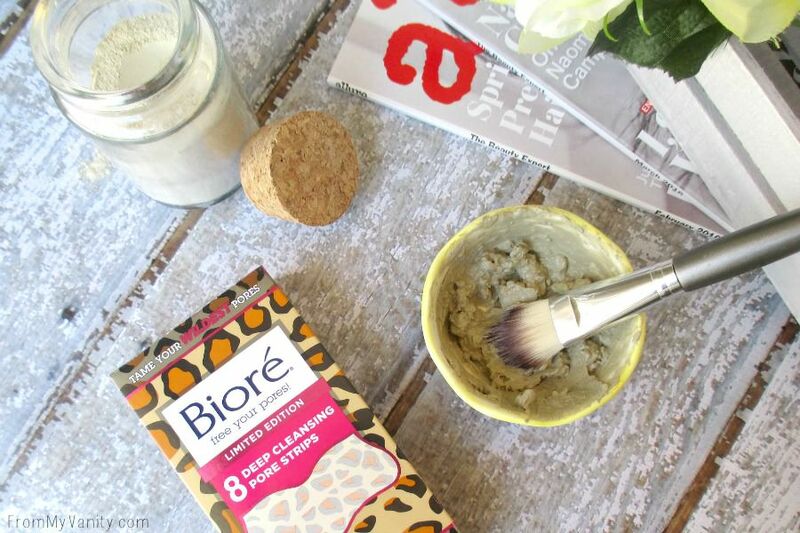 After doing the mud mask (which I do once a week) I like to follow up with a Bioré Cleansing Strips for my nose area. I don’t know about you, but those blackheads are so annoying and this strip helps to keep them under control. Why does mine have a cool cheetah print on it? They’re from the Bioré Tame Your Wildest Pores limited edition line that is only available at Walmart! As you can see, I found mine on an end-cap in the Cosmetic section. There are two prints in the collection, zebra and cheetah print. I went with the cheetah print. 🙂 There’s nothing different about the way you use these strips. They go on just the same as the others….just more fun to apply! BEAUTY TIP — Use a gentle toner to swipe over your skin after you’ve rinsed your face. This will close your pores and help keep them clean for longer! 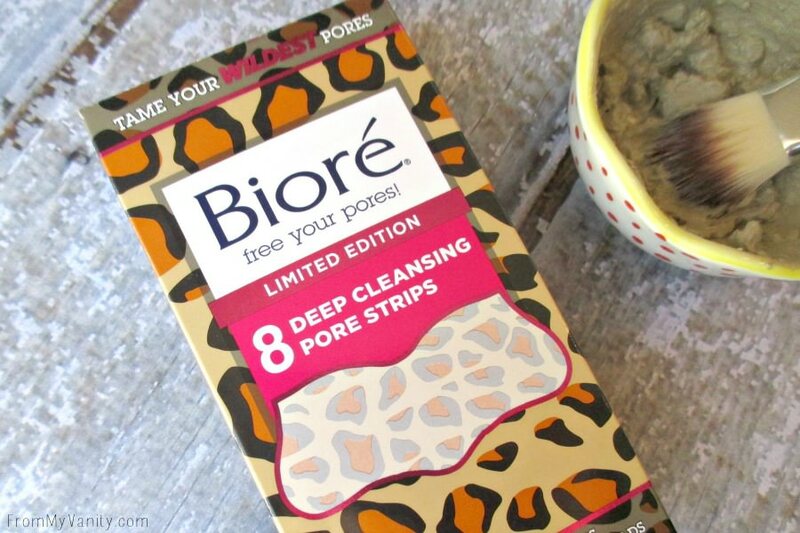 I don’t know how long these Bioré Cleansing Strips will be available, so make sure you go visit your local Walmart soon to see if you can find these! And if you want to stay up to date with this collection, visit the social hub page to see other people’s experience and fun photos! 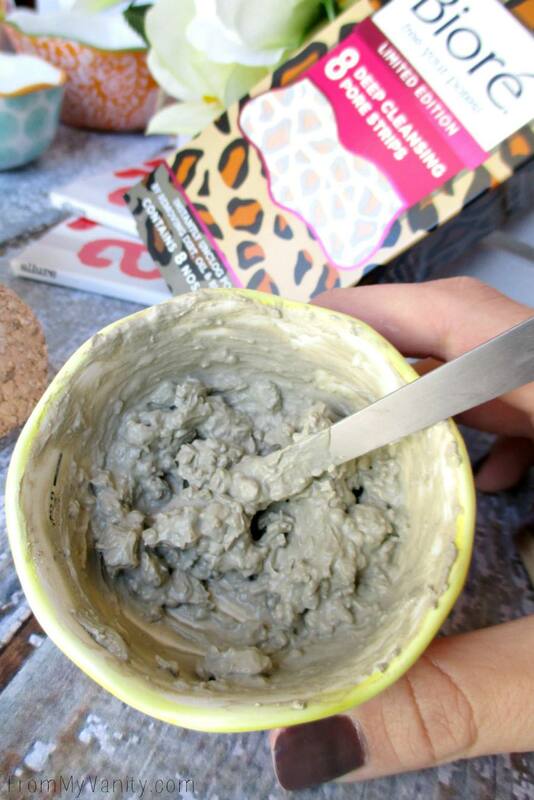 Have you used Bentonite Clay as a weekly face mask? Do you use Bioré? Let me know if you’ve seen this fun, limited edition collection in your local store — and if you plan to pick a box up! This is awesome!! Love this post! Awesome masque idea!! 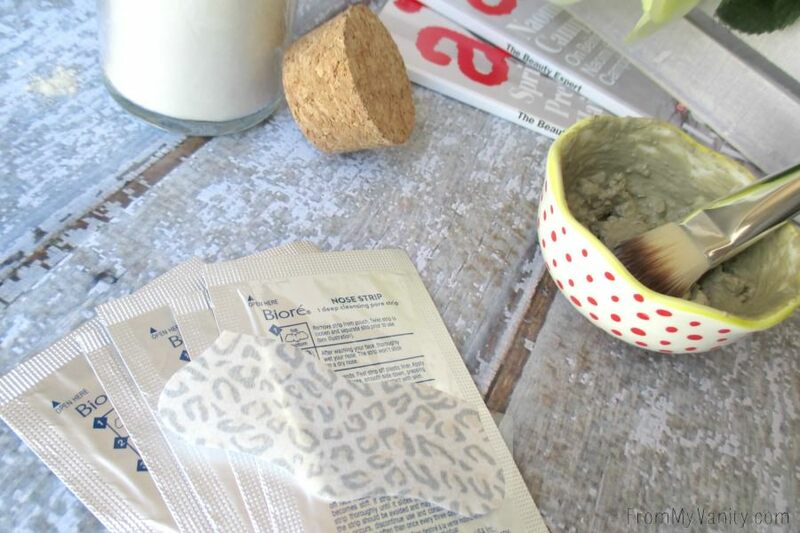 This masque is so simple, but it’s so great for so many skin types and issues!! Yes, it is! I love it and have been using it for years! When I was younger, I adored mud masks because they work! I’ve got a mud mask that I have to try out for review and I’m a little nervous about it with my dry, sensitive skin. Hopefully I’ll be fine. 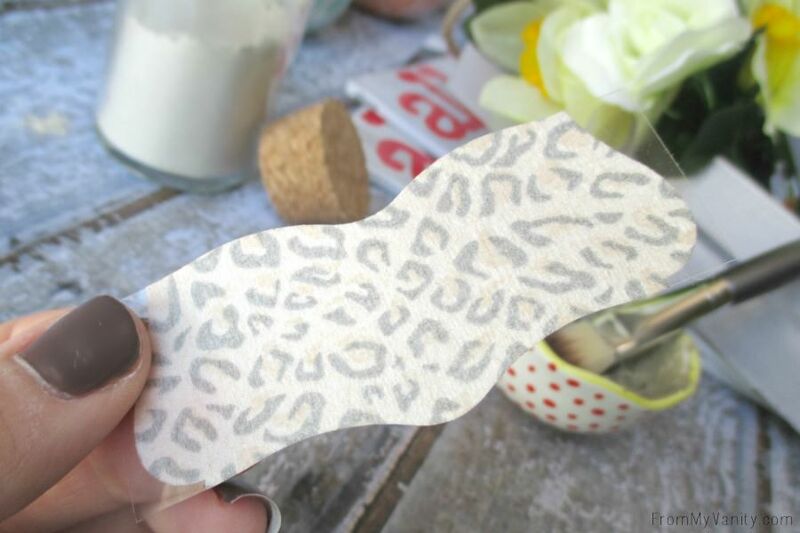 Love your cheetah Biore pore strips. They’re very cute! I hope the masks work for you! This mud mask does wonders for my oil skin, but not sure with dry skin. I have mixed feelings about the Biore strips. It’s kind of satisfying to see if it catches any blackheads, but I don’t like having to rip them off my nose, and the blackheads always seem to come back for me shortly after. But then again, I’m also really acne-prone. I know a lot of people swear by those strips, though! I use these strips every so often, as I don’t have a huge issue with blackheads. But I agree with you — it’s not pleasant to pull them off my nose. Ouch! Maybe try a good pore shrinking cream right after using the strips? Help close things so it doesn’t get clogged so easily. 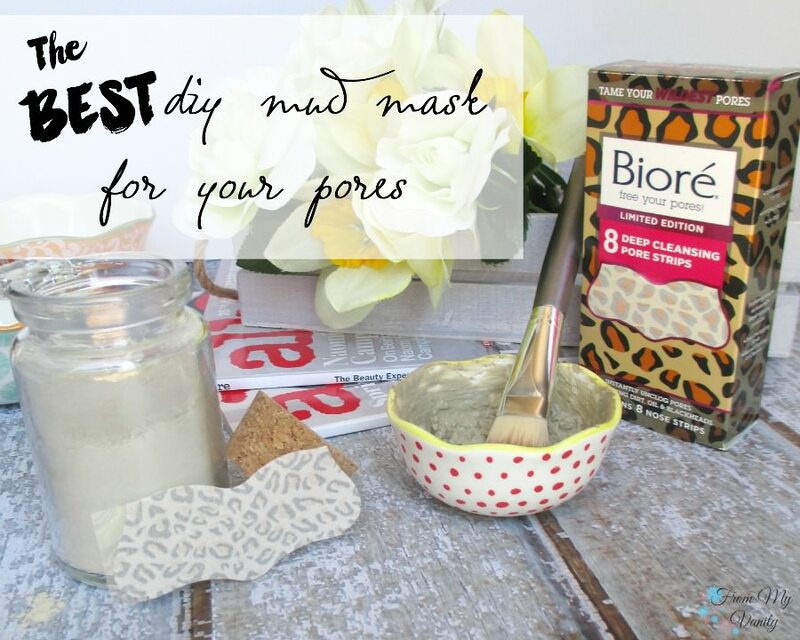 How great that you made your own mud mask. I’m too lazy to do that but I do love masks. The new Biore strips are great looking. 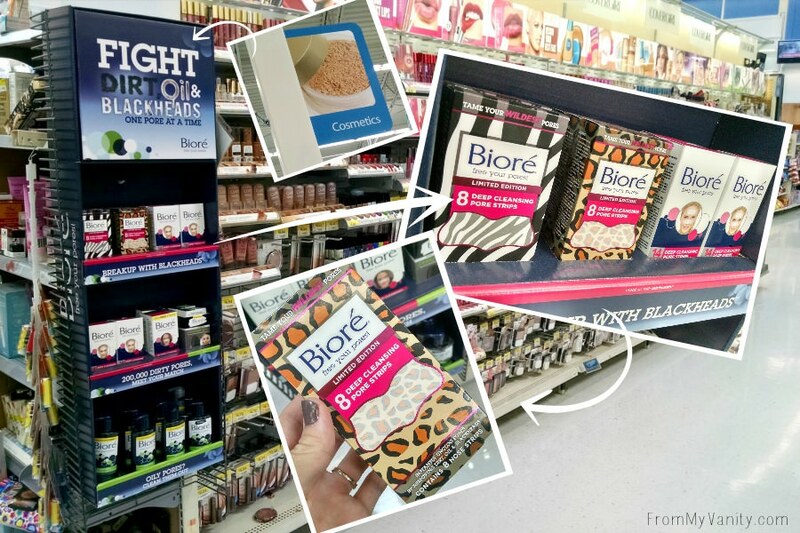 i love the biore strips! i’ve tried making my own (even before pinterest) but nothing can beat them. the fun cheetah print is cute too. I just used them on my hubs, who has large pores that are always getting clogged, and they do the job so well! The cheetah is so fun! I love mud masks! I have some bentonite clay as well, I’ll never finish it! 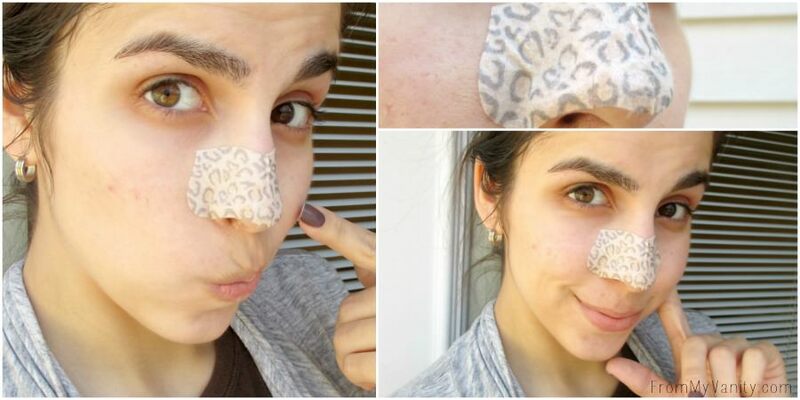 Those pore strips are adorable. Need to get me some pore strips ASAP! Mud musk is indeed a must for cleaning out pores. Don’t use it as much and I should so thanks for the reminder! My face is screaming for a mask, this looks awesome! I have super oily skin, so Clay masks are always my favorite,.. Yes, mine too! They’ve always done wonders for helping with oil and keeping acne breakouts at bay! 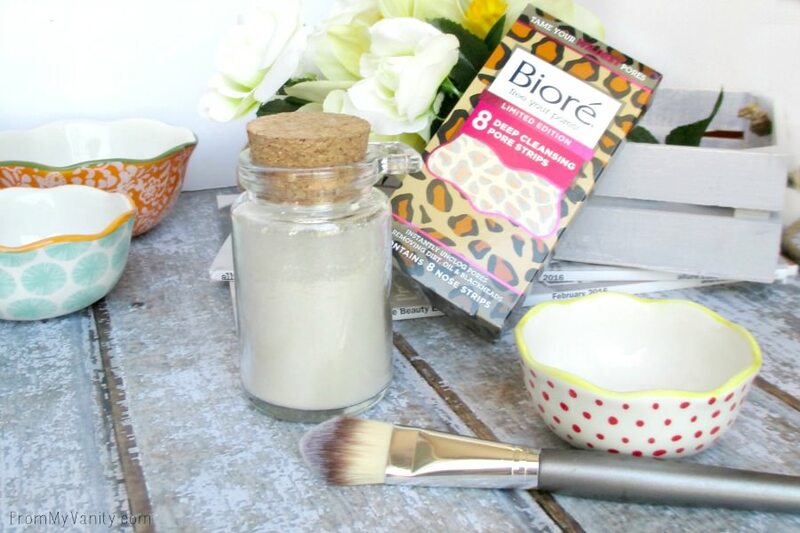 Where do you buy the Bentonite Clay?